← Kickstart This: Pigs vs. Monsters! 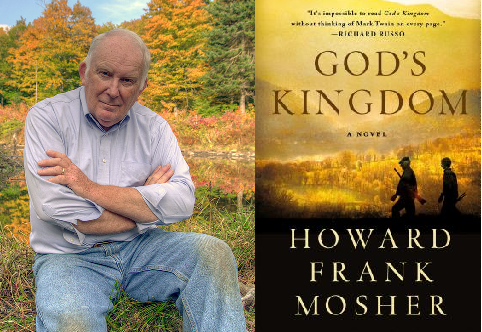 Vermont author Howard Frank Mosher, known for his novels A Stranger in the Kingdom, and Where the Rivers Flow North, announced on Facebook earlier today that he learned that he has an aggressive form of cancer, and has entered hospice care. In less than two months, though, I have gone from feeling pretty good to being in hospice care. Our kids and grandkids have been with us, and I’m comfortable. I’m also grateful for all my bookseller friends, writer friends, reader friends and friends in general who have been so supportive of me and my work over these many years. Mosher’s next book, Points North, was expected to be released later this year, which would bring his Kinneson family (featured in A Stranger in the Kingdom and God’s Kingdom) into the present day. “Jim Kinneson is now editor of his late father’s newspaper, his attorney brother Charlie is now a judge, and more is revealed about the Reverend Mr. Pliny Templeton.” He noted that his wife would provide updates to fans in the days to come. This is particularly tragic news: Mosher is one of the best known authors from the state and captures the character of the region and its inhabitants. His novel A Stranger In the Kingdom was filmed by director Jay Craven, who later also adapted Disappearances, Where the Rivers Flow North and Northern Borders to film. Our best wishes are with Mosher and his family during this time. Howard is the best man I have ever known. His family is incredibly strong and loving. This is a sorrowful time for the state of Vermont, as a whole.